On our last day in Palawan, we had to get up quite early in the morning to see the famous Puerto Princesa Underground River. A UNESCO World Heritage Site, it is said to be one of the highlights not just of Palawan but of the Philippines in general and at the time of my visit, it was gunning for a spot in the New7Wonders of Nature (which it eventually got). 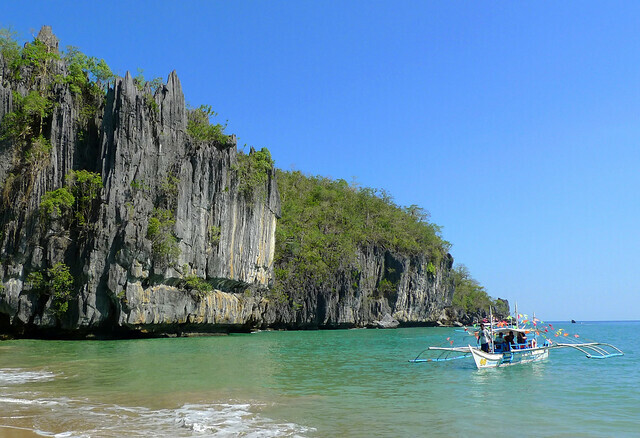 Although the Underground River is within the city’s boundaries, it is nevertheless quite far from the city center of Puerto Princesa. A drive of around 2 hours is required to get to Sabang Beach, where pump boats departing for the UNESCO site are located. Somewhere midway however, there is a great rest stop called “Buenavista Lookout” from which one can see a great vista of the surrounds.